Nick Ashby is a Brisbane-based artist who has experimented widely as a painter and a sculptor, exhibiting his works regularly in Brisbane and nationally at public, commercial and artist run galleries, as well as winning several awards including the Redland Art Awards in 2008. Ashby uses a subject matter, produced and reproduced each time differently from the first, building an appreciation for the many ways a subject can be viewed. 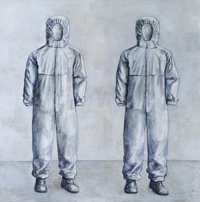 Image: Nick Ashby, empty suits (detail) 2011, oil on linen. Courtesy of the artist. Photography by Carl Warner.